Sappi demonstrated its continued commitment to environmental sustainability by encouraging customers to help it support charity WeForest at Labelexpo Europe, Brussels Expo. Postcard invitations encouraging customers to visit Sappi’s stand 5E17 at Labelexpo Europe include a sticker. For every sticker placed on a special wall at the show, Sappi will increase its sponsorship of WeForest to plant new trees. WeForest is an international non-profit organization whose mission is to create and promote a pioneer movement in large-scale sustainable reforestation to halt global warming. Eco-effectiveness is central to Sappi Europe’s environmental approach with everyone in the organisation committing to sustainability, combining ecology and economy, building on everyday initiatives and optimising the use of natural resources. Sappi is also registered with the EMAS (European Eco-Management and Audit Scheme) and is a pioneer in Chain-of-Custody Certification for its entire European operation under both the Forest Stewardship Council (FSC®) and the Programme for the Endorsement of Forest Certification (PEFC™). Sappi promotes credible forest certification within its fibre supply chain and monitors the origin of wood fibres and pulp. As a result, it finances and supports sustainable forest management. 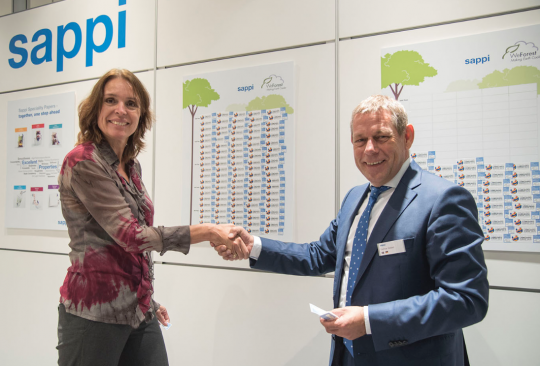 Pictured from left to right: Jeannette Van Bodegraven, Benelux Director of Partnerships WeForrest and Gunnar Sieber, Product Group Manager Release Liner at Sappi Speciality Papers. Sappi’s contribution will enable WeForrest to plant 4000 trees in Khasi HIlls India, a subtropical forest area that is designated as one of the most biodiverse and unique habitats of the Indian subcontinent bioregion.